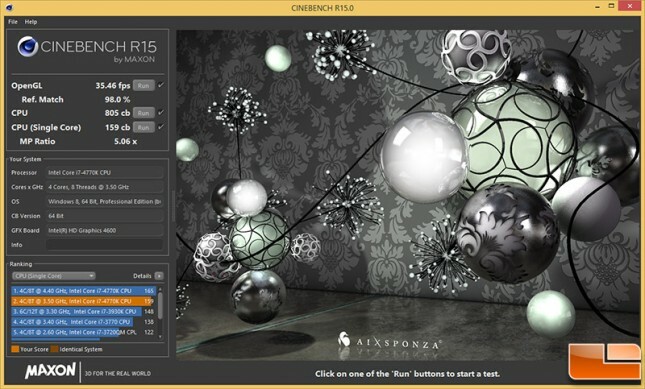 MAXON CINEBENCH Release 15 is an advanced hardware testing suite that assesses a computer’s performance capabilities. CINEBENCH is based on the same powerful technology as MAXON’s award-winning animation software CINEMA 4D, which is used extensively by studios and production houses worldwide for 3D content creation. MAXON software has been used in blockbuster movies such as Iron Man 3, Oblivion, Life of Pi or Prometheus and many more. 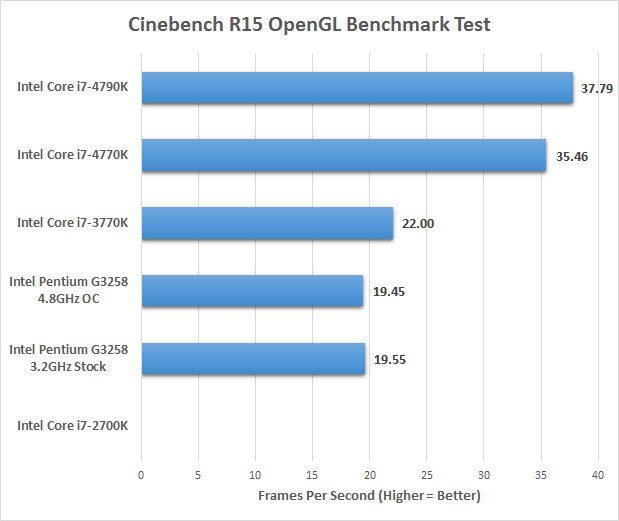 The new version of CINEBENCH includes the ability to more accurately test the industry’s latest hardware, including systems with up to 64 processor threads, and the testing environment better reflects the expectations of today’s production demands. A more streamlined interface makes testing systems and reading results incredibly straightforward. Again, higher Frames/Second and point score equal better performance. 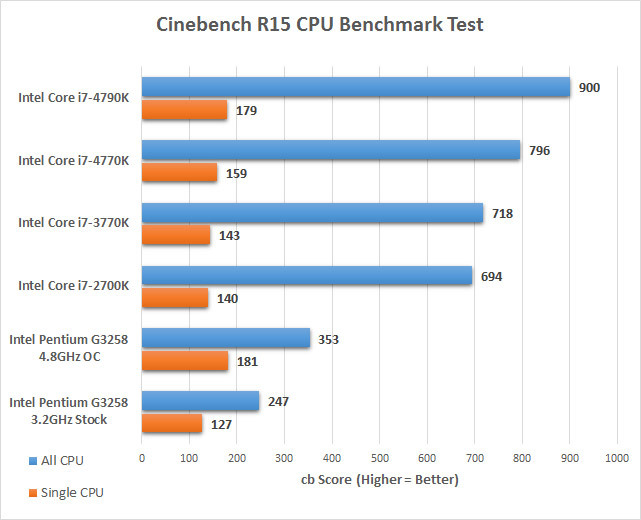 Cinebench R15 was able to put a 100% load across all the cores on all of the processors, which makes this a great benchmark to look at multi-core platforms. Benchmark Results: When it comes to OpenGL graphics performance the Intel Core i7-4790K with Intel HD 4600 graphics was running at 38 FPS and the Intel HD Graphics on the Intel Pentium G3258 was able to average 19.5FPS during the benchmark. There is no performance change on the GPU side on the overclocked processor as we didn’t overclock the GPU as we were primarily focused on the CPU performance for this article. For those that are wondering, the Intel Core i7 2700K with Intel HD 3000 graphics isn’t supported on the OpenGL benchmark. Benchmark Results: The fourth generation Intel Core i7-4790K Devil’s Canyon processor scored 900 points when using all of the available cores and had a score of 179 on just one. Out of the box the Intel Pentium G3258 scores 247 points on all cores and 127 with just a single core running the render test. With the Intel Pentium G3258 overclocked the multi processor test score went up to 353 and the single processor score jumped up to 181! This means that our overclock bumped up performance by 42.5% and more importantly the single threaded performance when overclocked was better than the stock Intel Core i7-4790K in this particular situation!